6 days guided walking in the Vanoise National Park from the comfortable Hotel Grand Bec 3*** at Pralognan la Vanoise gateway to the Vanoise. Ibex, chamois and the ubiquitous marmotte – observe the wildlife in the Vanoise in France’s first National Park. 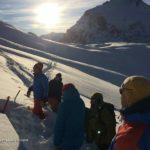 Discover the Vanoise with Mark, local resident with expert knowledge of the area. Walk amongst the high mountains and glaciers including the Grande Casse at 3,855m. Enjoy the abundant wild flowers in this unspoilt area of France. 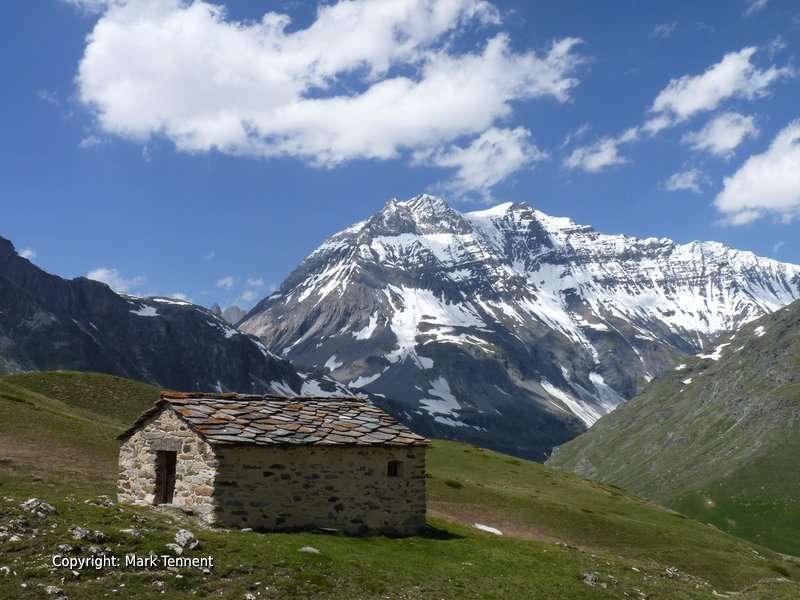 You will enjoy 6 days guided walking in the Vanoise, one of the most beautiful and unspoilt mountain ranges of France. The Vanoise has been protected since 1963 when it became Frances’ first national park. You will find a time-less beauty in the Vanoise. The mountains created when the Alps where formed have since been shaped by glaciers and high up the glaciers stand watch over us high above. You will discover the stark beauty of the high mountains and the softer, friendlier feel of the valleys. In the valleys traditional chalets blend into the landscape with local stone and wood used to create buildings that stand the test of time. Traditional farming takes place and you may have the opportunity of seeing Beaufort, the famous local cheese, being produced at a farm. The sound of cow bells in the alpine pastures fits with the sounds of tumbling mountain streams and the cries of marmottes. The Vanoise is home to a large population of ibex. The creation of the Vanoise National Park helped to re-introduce the ibex into France after they were almost hunted to extinction. The ibex are quite approachable and you may have the opportunity for some great photographs or just sitting observing these majestic animals. 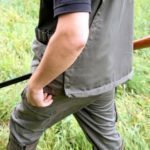 Mark will lead you to areas where you have the best chance of seeing them. The Vanoise is home to three breed pairs of Bearded Vultures (or Lammergaiers). These huge birds with a wing-span in the region of 2m 80cm are nature’s recyclers feeding on the remains of animals that have succumbed to old age or winter’s rigours. Soaring effortlessly on upcurrents of air the vultures patrol the skies looking for their next meal. Chamois, a goat-like animal, that is adapted to steep rocky terrain are more elusive. However knowing where to look is the key. You will certainly see the cute looking marmotte enjoying the lush alpine meadows. The marmottes live in family groups close to their burrows with “look outs” giving shrill whistles to warn their mates of possible danger from the sky or on the ground. The guided walks will be chosen to help you to see the variety that the Vanoise has to offer. Each walk will be chosen to suit your desires and those of the group. You will benefit from small groups, no more than 8, enabling a more personal experience where you feel part of a group of friends rather than being lost in a crowd. D1 – Transfer from either Geneva airport or Chambery railway station. Settle into the Hotel Grand Bec in the centre of the village of Pralognan. 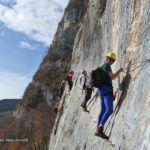 D2 – Col de Napremont (Pralogan) – a wonderful walk with magnificent views dominated by le Mont Bochor and the Grande Casse. Varied terrain alternating between the alpages and the forests. A great day in the mountains. D4 – Lac Blanc and the Refuge Peclet Polset (Pralognan). There is normally the chance to visit a farm where Beaufort cheese is made over an open fire in huge copper cauldron’s. D5 – Champagny Le Haut. Nestling in a hanging valley Champagny-le-Haut with it’s baroque church is a picture-postcard environment. 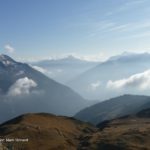 D6 – Col du Grand Marchet – Refuge Vallette. Leaving from near the hamlet of Prioux we will climb steadily through the alpine pastures to reach the Refuge de Vallette; perched above the valley. A chance to take in the tremendous views and look up to the hanging glaciers above. 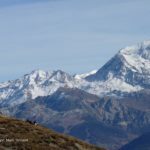 D7 – Col du Saulces – Petit Mont Blanc – Col du Mone.